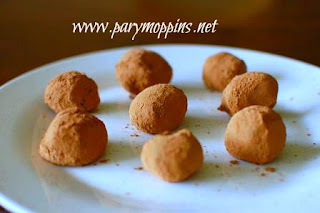 Remember the truffles I made for Supper Club last week? If you have any leftover, they make the most gloriously decadent hot chocolate. One of our favorite tea rooms in England was in the picturesque village of Bickleigh and appropriately named Bickleigh Mill. This is the way they would make hot chocolate, or rather, had you make hot chocolate. They would bring out a wooden coffee stirrer with a blob of dark chocolate on the end which you were to stir around in your mug of scalded milk. It was divine. Put a couple of truffles (preferably that have not been powdered but either way is fine) in the bottom of a mug. Scald some milk and pour it in the mug. Stir until the chocolate is melted in the milk has been infused. Alternatively, skewer a truffle (or two) with a stirrer and then swirl in the hot milk. You could also make a rich mocha using coffee to melt the truffles. Warning: once you have tried this method of making hot chocolate, you may never go back to the powdered mix again. Which I had one of these special treats with my afternoon tea. Your recipe is fabulous and thank you so much for sharing with Full Plate Thursday. Have a great weekend and come back soon! This is the yummiest way ever to make hot cocoa Miz Helen. :) I do hope you give it a try.